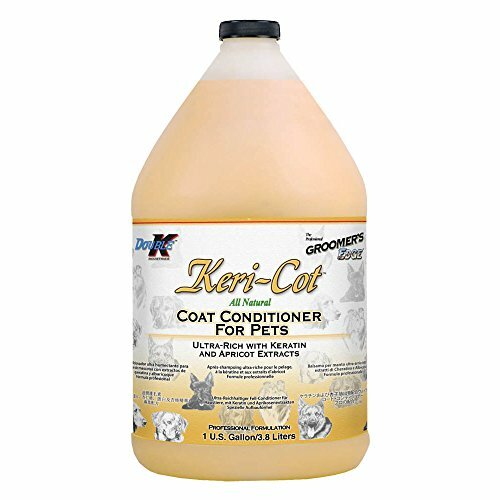 Groomers Edge Keri-Cot Conditioner features Keratin and Apricot which are combined in this rich, moisturizing conditioner. Restores life to damaged hair and protects against breakage. Fresh apricot scent! Enriched with Vitamins, Aloe, and Amino Acids. Use full strength for very damaged coats. For use as a rinse at dilute up to 4 to 1. Great for Dogs, Cats, Puppies, Kittens and all companion and farm animals. If you have any questions about this product by Double K, contact us by completing and submitting the form below. If you are looking for a specif part number, please include it with your message.